Carl Froch has targeted IBF super-middleweight champion Lucian Bute if the Nottingham boxer makes a successful defence of his WBC title. 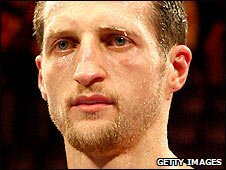 Undefeated Froch, 31, faces Jermain Taylor on 25 April in Connecticut for the first defence of the crown he won by beating Jean Pascal in December. "I want to unify the division and Bute is someone who is stopping me from doing that," Froch told BBC Sport. "If I get through Taylor it is a fight I want and a fight I know I can win." Bute, who was born in Romania but resides in Canada, retained his title with a fourth-round stoppage of Fulgencio Zuniga, with Froch an interested spectator. And Froch, who holds a holds a perfect 24-0 record with 19 knockouts, would also be willing to travel to Canada to take on the unbeaten, travel-shy 29-year-old. First, though, Froch must get past American Taylor, someone he knows he cannot take for granted. 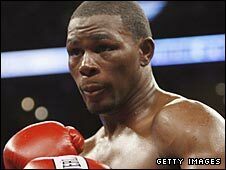 Taylor, 30, is a former undisputed middleweight champion and has lost only twice in 31 fights, winning 17 bouts by knockout. In 2005 he beat Bernard Hopkins to take all four middleweight titles but lost his belts when he was beaten by American Kelly Pavlik two years later. "I'm not complacent," said Froch. "Taylor's big and strong and he has beaten some very good boxers so I'll have to be in the same shape as I was for the Pascal fight. "If I am, there's only going to be one winner - me." Froch has tucked himself away at a gym in Loughton, Essex, as he prepares for his first title defence and will head to America two weeks before the fight. "Training is going well," said Froch. "I've had a few setbacks, such as a twisted ankle suffered while sparring, my rib still gives me problems from my last fight and my hand is sore, but that is an old injury. "Luckily, I've managed to stay clear of anything serious. Boxers are never 100% going into any fight but I'll be ready for Jermain Taylor." The contest at the Foxwoods Resort Casino in Mashantucket will be shown live by American broadcaster Showtime. Although there is no confirmation of which UK broadcaster will show the fight, Froch did reveal talks with several television stations are under way. "Mick Hennessy, my promoter, is in talks with various networks," stated Froch. "ITV have shown an interest, as have Setanta. "Setanta call themselves the home of boxing, so it would be a shame if they didn't broadcast the fight."